Baz Luhrmann is something of an acquired taste for most people. You either love him or hate him, and I happen to be one of those who usually loves him, so I admit I may be someone who's more susceptible to the charms of this movie, which I think are many. I appreciate his bombast and theatricality, and I always look forward to it as something fundamentally different and unlike what typical filmmakers produce. This version of The Great Gatsby is everything you expect from a Luhrmann production (loud, excessive, highly stylized), but maybe also something you don't- it's surprisingly faithful to the classic story itself. It's also a hell of a lot of fun. Luhrmann clearly loves the novel, so much so that he lifts text straight out of the book and spreads it across the screen in various typeface- an example of the kind of fanciful indulgence that some label as over the top and silly, but I happen to enjoy immensely. There is always plenty to look at on the screen in his films, perhaps never more so than in this one, which is packed from wall to wall with crowded details in the ravishing sets and elaborate costumes (this is this year's costume and maybe production design Oscar winner for sure), but luckily that's not all there is, and the thing that makes The Great Gatsby work the most is Leonardo Dicaprio in the title role. Not since Titanic has he been in a movie that strives more to showcase his natural charm and movie star charisma, and it comes so easily to him here that we are reminded once again that Leo's a romantic leading man in his bones, no matter how hard he tries to hide behind all those grim character roles and autobiographical parts. He's completely natural and fully embodies the enigmatic and secretly tormented Gatsby- there's virtually none of the strain I can sometimes see in his attempt to bury his movie star shine in films like J. Edgar and Blood Diamond. Faring less well however, is Carey Mulligan as Daisy. She's filmed beautifully in every frame, but she's just too sweet and sincere for the role. 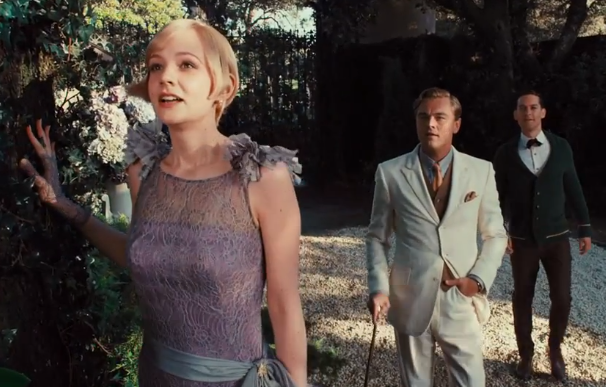 Daisy Buchanan's ultimate actions make more sense in the finale if you sense a hollow and materialistic center under the perfect exterior- she's a good actress but here she seems miscast. The other actors all turn in good performances- Tobey Maguire serves his function as Nick, our narrator and entry point into Gatsby's world, but Australian actors Joel Edgarton and Elizabeth Debicki are especially good as Daisy's husband Tom and her friend Jordan Baker, bringing a real urgency to what could be minor parts. Luhrmann's taste for pure spectacle is indulged here in every way you can imagine, from the lavish parties of the rich and famous meshed with a modern hip-hop soundtrack to CGI sets and cartoony visions in the night sky of human images tearing up letters- if this kind of thing is too much for you than I would presume you've never warmed to Luhrmann's style overall, but I think his fantastic theatricality enhances the fun and I was surprised to see how much substance there actually is in the end- with an extremely faithful climax and high stakes dramatics raised for the Gatsby character in particular. All in all, this is a very fun and over the top version one of the great American novels, and if it serves to bring more exposure and awareness to classic literature by reinventing it for a modern age, no matter how radical a manner in which it's done, what could possibly be the harm in that? Luhrmann pays tribute in his own way, and it's a big, bombastic blast from beginning to end. September 28, 2013 by Ariel Shavonne.